The OULDI and Course Business Models projects at the Open University have built an experimental model for mapping learning activities across a range of or sequence of learning events. 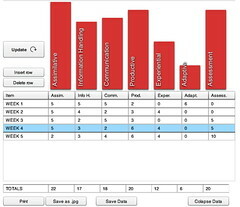 Access the activity widgit here and use the tool to visually map the pedagogy profile of an activity, unit, module or course. The tool provides information about the spread of activities in terms of time and weighting. This entry was posted by dgoodman. Bookmark the permalink.